Where to buy Brazilian coffee? This question usually pops up in the comments areas. I fixed this little guide for that. Check it out! I have already stated here that it is my true belief that coffee drinkers would be much happier if they moved to Brazilian coffee. And one important consideration you must take care of is what quality you will be looking for. I suggest you try reading this article, Commercial x Gourmet Coffee Definition if you haven’t yet decided. But what should these average unsatisfied coffee consumers do to find how to Buy Brazilian Coffee? I have seen that question asked many times, either on this, or other blogs, as well as on online conversation. So, we will try to roughly and in general answer that question to find a common sense for a wide variety of places. I think a general protocol can be figured out, though. Amazon has a variety of options; from commercial to gourmet, from ground to just roasted, to unroasted green coffees. Here are some Amazon suggestions and a search box for your convenience. Coffee machines, filters, coffee recipes books. Many of the coffee articles and reviews on this blog have links to their specific products as well. A New York-based roaster with both physical and online stores. These guys have excellent credentials and deliver to North America, including Hawaii and Puerto Rico. This American dealer is a great source of Brazilian specialty coffees in a very large worldwide catalog. Last time a checked, this United States-based company had one type of green Brazilian coffee. Sweet Maria’s is a well-stablished distributor with a reliable name. The ship internationally. 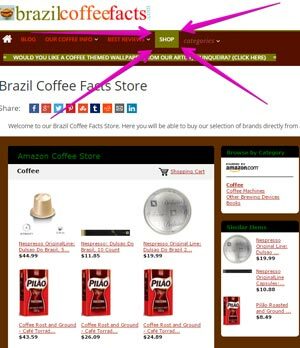 This a large coffee and tea web store that sells only one type of Brazilian Coffee. At least it is the widely respected Santos type. I have not tasted this one, but if the origin is genuine, you’re in for a great Mojo ride! 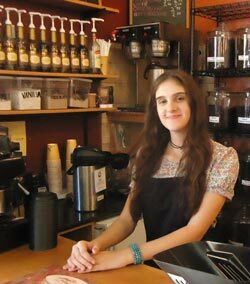 After Amazon, this Chelsea-based dealer is my best option for the average British coffee consumer. They also deliver worldwide and are a good option for EU countries. This merchant is a safe bet to get your Brazilian coffee buying experience started. Whittard has an outstanding and surprisingly broad selection of Brazil-based coffees, as well as other coffees and also teas. This dealer is an Australian based company that is worried about providing good coffee to both the gourmet and the average drinkers with the same care. They have an extensive catalog of varieties and offer true origin Brazilian coffee as well as in mixed blends and packs. Another fine option for online coffee and equipment. The best solution, in this case, is your local roaster or dealer. Contact them and ask if they sell Brazilian coffee. This option is not as comfortable as buying online, but, especially with roasters, you will be buying the freshest option possible in your area. Partnered with producers worldwide, this is a company with offices and warehouses in USA, Australia, and Europe. 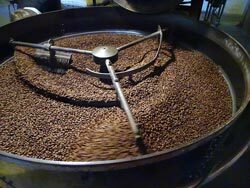 They have a variety of high-quality green moho beans from all over the world, including Brazilian coffee. They have listings of products in their warehouses that roasters can select from. If your local roasters, or dealers, don’t have Brazilian coffee available yet, tell them about these guys. 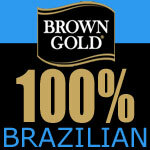 This American based large coffee company has a product called Brazilian Blend Coffee. Available in 24.2 and 10.3 oz. packs. Find a local dealer and go for it. Where to Buy Brazilian Coffee? Aren’t Brazilian Stores Obvious Enough? Some places have a significant concentration of Brazilian product consumers. If you live in one of those areas, you are probably near a Brazilian product store or supermarket. I guarantee that if you don’t find Brazilian mojo in one of them, the shop owner is on a fast journey to bankruptcy. If, by any chance, you live in an area that has Brazilian coffee to offer, please leave a comment bellow, telling us about it. I suppose, and hope, a day will come when everyone will be able to enter a supermarket and find commercial and gourmet Brazilian coffee brands at competing prices. Until then, aside from the little difficulties, it is not that hard to work that lack of scaled availability. If you are looking for places to drink the Brazilian most famous beverage, a guide like the above is little more difficult due to geographic details. Nevertheless, I will be posting some guides for coffee places that serve Brazilian Brewster in specific places. Please leave a comment about Where to Buy Brazilian Coffee. Where to Buy Coffee Machines Online? Thanks for your support. That question is not a simple one to answer. Theoretically, in Brazil we should have coffees very similar to Colombia, and also some very different. That is because we have nearly all types of coffees produced here. The problem is that coffee brands usually have different blends from place to place and even from year to year. The coffee gourmet pure origin coffee from South Minas is probably the most similar to the Colombian gourmet pure of origin. Oh my goodness!!!! I love brazilian coffee. There is a local place that sells a Brazilian coffee, fresh roasted from Mogiana. It tastes like a peanut butter cup and smells like nothing I’ve EVER smelled in my life. I can’t imagine drinking the muck that most people drink. I definitely wouldn’t even drink coffee it weren’t for this local roaster here! Thanks for sharing your experience. Would you mind giving me some information about those guys? I could write a post about them. I’ve just recently started to “get into” coffee after a lifetime of drinking the worst kinds of crap! Things changed after a friend of mine gave me a bag of Ethiopian beans and opened my eyes to a world I’d been scarcely aware of. Though I’ve been a fan of Ethiopian beans like Sidamo, I’m looking to broaden my horizons. If you had to recommend one Brazillian bean to start with, what would it be? Thanks for sharing. I’ve tried Ethiopian, but I don’t remember the name. I do remember to have tried 2 different brands, though. Great coffees! We rarely get imported coffees here in Brazil, so my only chances are when I travel abroad. I’d suggest that you start with commercial brands like Pilao, 3 Coracoes, and Melitta. They might be not-as-good as a gourmet Ethopian, but you will find them a pleasing journey and they are also less expensive. I drink Pilao regularly, my stepson drinks 3 Coracoes, my sister, Melitta. They are all pretty good if you don’t burn them by boiling the brew. I find it very tricky, a trap even, to suggest this or that brand. People’s tastes vary a lot, so I’d rather strongly advise that you experiment a lot, even by mixing some brands and, maybe, trying other brewing methods. Great article on Brazilian coffee. Most of the coffee I see around here is Colombian so Brazilian may be a refreshing. I’ll have to buy some now that I know where to look. I’m sure the Folger’s one would be good, but I would like to try something beyond the typical name brand. Sounds like a coffee quest for me! Thanks for sharing you thoughts about coffee. I wish you a pleasing ques, and I know it will bet. I think that now the Olympic games are in Rio, there will be a lot more interest in Brazilian products and coffee is probably one of the most famous. Hopefully more people will start drinking real Brazilian coffee instead of the cheap stuff we can buy in the supermarkets. The difference is amazing! Hi there — I wonder whether you ever found out where to source the peanut butter cup coffee mentioned in one of the comments? I’d like to give this a try. Generally, I like really dark roast, though. One thing I’d like to know is whether you can recommend some Brazilian organic & fair-trade coffee? It is extremely important to me that I only buy fair-trade and either organic or otherwise certified. Thanks! taste is such a personal thing. I have never felt that taste in any coffee. Besides personal, people also describe states if different ways. More on that on a specific article. I’ve never tried Brazillian coffee, mainly because I haven’t seen it advertised so much in shops, and also because I’m not much of a coffee drinker aha. Do you think there is a significant difference in taste between the Brazilian coffee and other, more commercialised brands? Thank you, maybe I’ll get back into the coffee scene again! Yes, I think so. I suggest you try some and see for yourself. I’d sound suspicious if I told you the truth about commercial Brazilian coffee being the best. haha. Well I am fortunate enough to have a local coffee dealer just down the road who sells brilliant Brazillian coffee. I personally buy ground coffee as its practical and easy. But I hear conflicting advice that buying the beans roasted is best and others say that you should buy green and do it yourself. What do you prefer? I think it all depends on how much buy it each time. If you are willing to buy your coffee constantly, then buying ground is a fairly great option, as long as your dealer roasts it regularly too. No doubt that buying it roasted is better than that, and buying it green even better, but you have a learning curve there. Roasters know how to roast. Ordinary people have to learn. There are cost/benefit and effort/benefit ratios that must be considered there. Personally, I’d go for the roasted beans to grind at home (easier learning curve) as long as the dealer has a tight and transparent, frequent schedule of roasting. This is such a great article! Finding where to buy Brazilian coffee is no easy task if you live away from the convenient areas. I believe that buying coffee on Amazon is a great option for us. Thanks for the post. Keep the great work. Best wishes. Amazon has some great Brazilian gourmet coffee options, as well as commercial options. Thanks for stopping, sharing your opinion and support. Cheers!